A visit to the nation's Capitol by Santa Barbara eighth-grade students was interrupted by a shooting, in which police shot a man with a gun at the Capitol Complex. Junior high school students from Santa Barbara joined a temporary lockdown at the nation’s capital Monday when police shot a man with a gun at the U.S. Capitol Complex visitor center. According to the Washington Post, road barricades went up immediately and police with automatic rifles took posts on street corners on alert status after the attacks in Europe. At around 3:15 p.m., D.C. police tweeted an “isolated incident” had occurred. 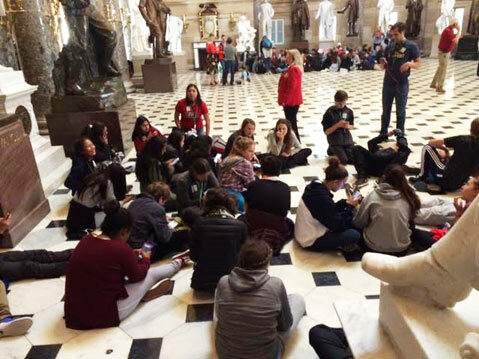 The 84 eighth-grade students were on a spring break visit that included the White House and Ford’s Theatre in the morning, and they’d assembled for a tour of the Capitol when the incident broke out. During the one-hour lockdown, the students contacted their parents, and accompanying teachers informed school officials, said Barbara Keyani, with S.B. Unified. The self-financed trip was arranged for La Colina, Goleta Valley, and Santa Barbara junior high school students and seven teachers. The students are scheduled to continue their trip, as long as the sites they plan to visit remain open. The man was taken to the hospital, said the Post, and was in surgery.